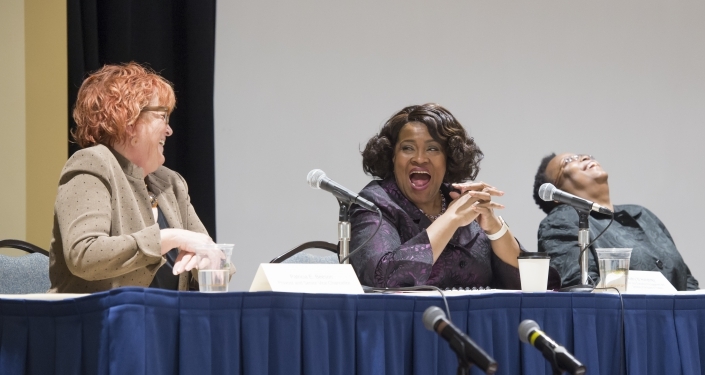 Provost and Senior Vice Chancellor Patricia E. Beeson attended Faculty Assembly on March 13 to review with members her office's developments and accomplishments over recent months. Amy J. Wildermuth, associate vice president for faculty and academic affairs at the University of Utah, has been named dean of the School of Law. She will begin her deanship on July 1. University Senate presidential candidates Carey Balaban, Chris Bonneau and Wesley Rohrer respond to questions posed by University Times Editor Ellie Graves. Through Pitt’s place-based community engagement strategy, the University is putting more emphasis on collaboration among faculty, staff and students as well as building stronger relationships with neighborhood residents and organizations. The Office of the Provost and the University Center for Teaching and Learning have developed new online resources, faculty communities and workshops for faculty to enhance teaching techniques, increase the diversity of classroom lessons and gain new credentials in several teaching areas. Senate student admissions, aid and affairs committee members received an update at their March 8 meeting about Pitt’s incoming freshman class and the Office of Admissions and Financial Aid’s recruiting efforts. The Office of Diversity and Inclusion has recruited the first group of 20 staff members from across campus to become anti-bias trainers throughout Pitt. A proposal to allow postdoctoral professionals and research associates to have extended leave following the birth or adoption of a child seems headed toward administrative approval. A new cohort of 19 faculty members drawn from the ranks of faculty at Pitt’s Swanson School of Engineering, School of Computing and Information and School of Law are combining their areas of expertise to support Pitt’s Institute for Cyber Law, Policy, and Security. The University Times plans to unveil a newly designed website and e-newsletter next month.